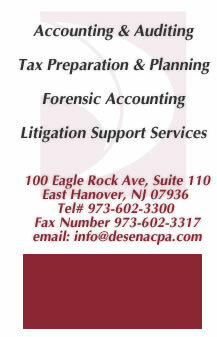 Raymond S. DeSena has over thirty years experience in both the public and private sectors of the accounting profession. He has a bachelor of science in Accounting from St. Peter's College and an MBA in finance from Seton Hall University. He is a member of the AICPA and NJSCPA. Before founding DeSena & Co. CPAs, Ray gained valuable experience with several medium sized New York City based CPA firms. He was also employed at Schering Plough Corporation as an Accounting Manager in their International Finance Division, and served as a controller for a small corporation. Marie L. DeSena is the co-founder of the firm, with engagement responsibilities including not-for profit audits, business valuations, and tax services. Ms. Desena graduated from Rutgers University with a Bachelor of Science in Accounting. She is a member of the AICPA and NJSCPA and has been working in public acounting for more than 30 years. Before founding DeSena & Co. CPAs, Marie worked for several regional accounting firms primarily performing government and not-for profit audits, as well as SEC registrations and commercial audits. Raymond B. DeSena's engagement responsibilities primarily include management advisory services, audits, litigation support, and business valuations. Mr. DeSena graduated from Pace University with a BBA in Accounting and also graduated from Farleigh Dickinson University with a Masters of Science in Taxation . Ray is a member of the AICPA and is a contributing author to the "Guide to PC Based Software For the Manufacturing Industry". Ray has been working in public accounting since 1990, before joining the Firm Ray was employed by National Distillers and Chemical Corporation and Schering Plough Corporation as an Internal Auditor. Additionally, while at Schering Plough Ray also worked as a Senior Financial Analyst in Corporate Finance. John DeSena graduated from Pace University with a Bachelors in Business Administration in 1989. John oversees the day-to-day operations at Desena & Company. His other responsibilities include accounting and auditing engagements as well as tax practice and tax planning services. John is also a member of the AICPA and NJSCPA. Thomas DeSena graduated with honors from Farleigh Dickenson University in 1994 with a Bachelor of Science Degree. Tom's primary responsibilities include accounting services, tax preparation and assisting with audit engagements. Tom is also a member of the AICPA and NJSCPA.